Today we will be integrating WebMerge with a Shopify account! Shopify is a great way to sell products or services online or at a storefront as it allows you to easily build a website and process payment transactions. Do you want to send your new Shopify customers a letter? With this integration, you will be able to automate the process of doing just that. In order to make this happen, we’ll be using WebMerge, Zapier, and Lob. 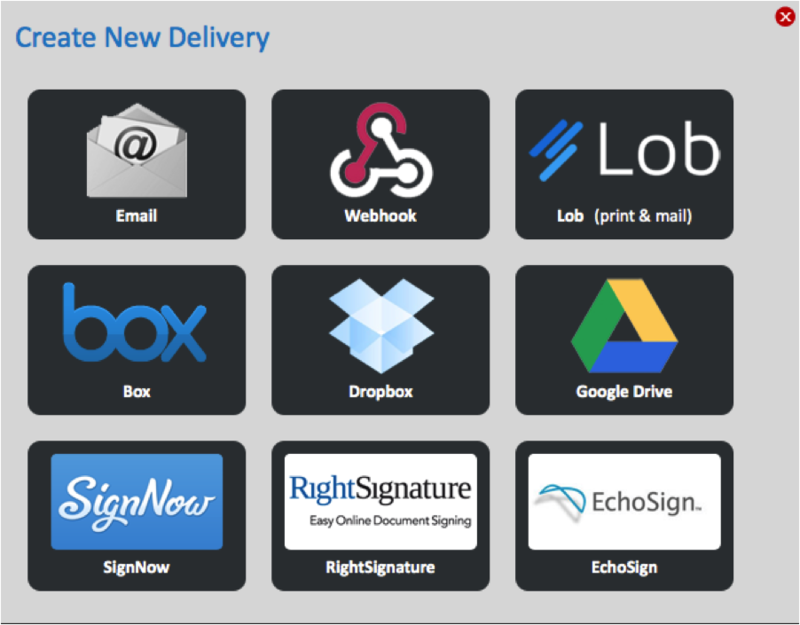 While we are in WebMerge we should setup our delivery options. Make sure to save your document from the documents builder. Click on the Deliver tab. Here we can specify how we want our document to be delivered once it has been merged. Click +New Delivery. 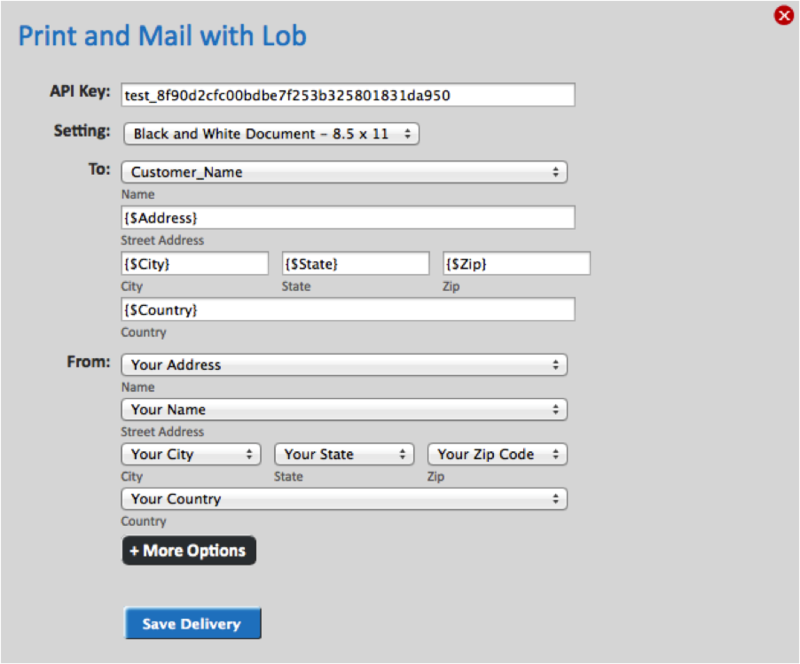 Click on the Lob print and mail option to have Lob automate your delivery. Fill out the following configuration with your Lob account API Key and add <<other>> merge fields for address information that we will be collecting through Shopify. Once we have our letter ready with merge fields scattered throughout and once we have set our delivery option, we can go to Zapier.com and connect our Shopify account to our WebMerge account. In Zapier, simply choose to integrate Shopify and WebMerge. 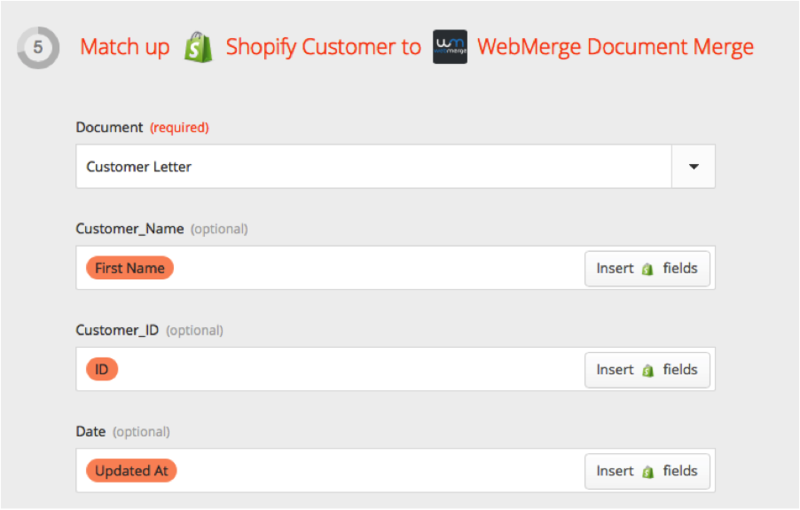 Here we are selecting the option to send Shopify information to WebMerge every time we input a new customer on Shopify. In steps two and three of the Zapier configuration process, we simply authenticate Zapier’s integration with our Shopify and WebMerge accounts. In step four of our Zapier configuration we have the option to set filters on how this Zap is triggered. For instance, we may only want to send this letter to customers who have an orders_count of less than 2. Note that there are many other filters you can set as well. For instance, maybe you want to tailor different documents to different States. You can do that here. In step five of our Zapier configuration, we match the Shopify information that will be collected at purchase with our WebMerge Document and the merge fields within it. Our merge fields will be populated by the Shopper’s information. In this example we want to merge Customer_Name, Customer_ID, Date, Address, City, State, Zip, and Country. Turn the Zap on and you are all set. 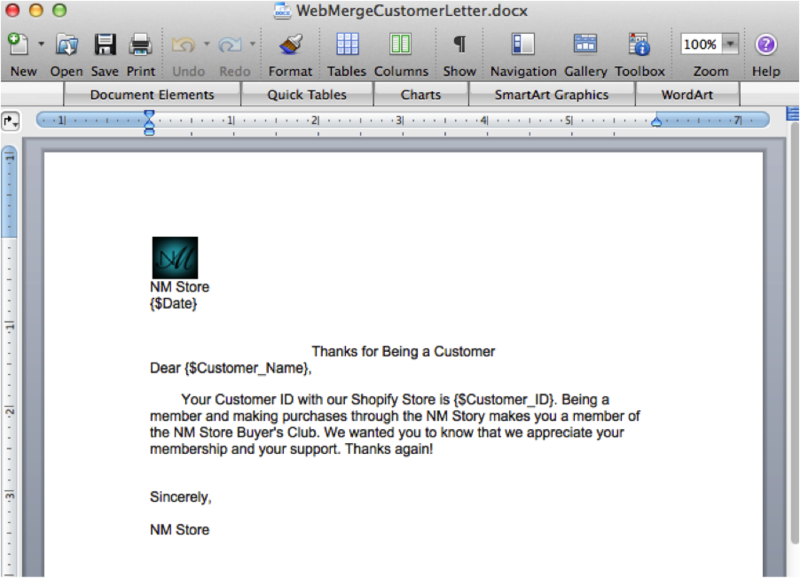 When we input a new customer in our Shopify account a document will automatically be sent to the customer via regular mail as a personalized welcome letter. All this happens automatically with each new customer entry on Shopify!